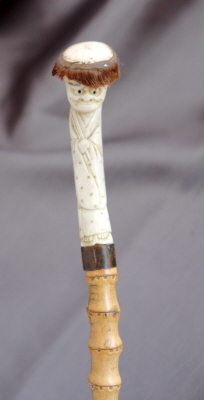 A very comical study in ivory of a bowing gentleman with metal collar. The study is mounted on slim line bamboo with original base metal ferrule. Good original condition with appropriate wear for age.Free from breaks or cracks, few little tufts a little mis, on the animal fur around the head rim.